Election Projections for Key's Offices "Key West Register Reader's Comments"
character, background and opinions. Board members review public records and files of news on the candidates' records. benefit of the editorial board's research. ONE OF KEY WEST THE DOG (.COM) FAVORITE SPOTS IS S.J.'S! 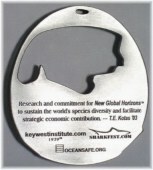 CONCHFEST™.COM... "Liv'n at the end of the old water pipe"ä "Key West Register Reader's Comments"
Sharkfest researchers have discovered while working with squid oxygen studies and with jellyfish enzymes a possible relief for the majority of arthritic sufferers. NanoAlphaä is currently under controlled testing /has showed results in controlled environs after days. Hulacaneä Official KWR Tonic: 2oz of Rum, Sugarcane stalk, 2oz Sweet & Sour mix, Secret ingredient, 1oz pineapple juice, Shake in a circular motion over ice and strain into a chilled martini glass, garnish with wedge of lime. Endorsed by the Research Group of the KWI - Dr. C. King / Prof. McGinness. In Past...Astronomers realized that an Asteroid in May and another one in June came within 290,000 and 75,000 miles, respectively, of hitting Earth. Each was large enough to wipe out Miami and larger area. In both cases, the realization came four days after the misses --- but Key West Soothsayer predicted in April of the two Asteroids near misses. Tugger "Tug" Smythe who was a guest at the Coral Bar on Stock Island before it was removed and is a frequent partner of Key's Bar's Capt .Collier told the Captain and a group of Sport Fisherman (witnessed by Key West Register Reporters) in April the prediction and detailed the phenomenon of the Asteroids - "Tug" stated that "they would miss Key West in the next 90 days and that their magnetic fields would create some great fishing in the Gulfstream" - Update: Tugger returned looking for The Coral and gasped "that the meteor must of hit it while he was up on Big Pine celebrating Nov 1st his dog "Commish's " birthday. 'Key West Asteroid Alert!' © & NASA Reports "Allways Look Up!ä"
*-- Hemingway found? at Hurricane Hole on Stock Island! . *-- Key West Taxes (EYW.US Meeting) - Commission sings "Up Up and Away" to a millage rate and gambles on cruise ships and other tourist revenue grabbing "cookies". *-- In Honor of Thor Heyerdahl: a Friend to the Founders of the Key West Institute - the Norwegian adventurer who crossed the Pacific on a balsa log raft and detailed his harrowing 101-day voyage in the book ''Kon-Tiki,'' passed on - he was 87. r. He passed at his home in Colla Michari, Italy, where he was spending the Easter holiday when he became ill and was hospitalized in late March. ''Norway has lost an original and spectacular researcher, explorer and adventurer,'' Prime Minister Kjell Magne Bondevik said. Experts scoffed at Mr. Heyerdahl when he set off to cross the Pacific aboard a balsa raft in 1947, saying it would get waterlogged and sink within days. After 101 days and 4,900 miles, he proved them wrong by reaching Polynesia from Peru in a bid to prove his theories of human migration. His later expeditions included voyages aboard the reed rafts Ra, Ra II, and Tigris. His wide-ranging archeological studies were often controversial and challenged accepted views. Mr. Heyerdahl made a appearance last year in Oslo, Norway to award the Thor Thor Heyerdahl International Maritime Environmental award to the Green Award organization. The Key West Institute remembers his excitement and wonder about the world - The KWI has initiatied in conjunction with corporate sponsors the annual "Thor Hederdahl Explorer's Honor " that will honor his excitement for the sciences for generations. Past discovery of a No-Life area in the Gulf of Mexico just north of the Florida Keys continues to be of concern. 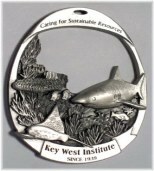 The Key West Institute and other groups have focused efforts to study the dangers to the environs and human interaction with the area. Dr. Winston Thompson, Capt.TK, and Dr. Charles King are currently on the research boat "THOR" in the area reviewing the chemical composition of the Gulf sands and water structure - "we will further our research to areas of possible source and will review at the KWI Conference in New Orleans" said Dr..TK.- It is our current review that concluded that the black water was made up mostly of nontoxic microscopic organisms called diatoms that had bloomed with the help of nutrients supplied by decaying red tide algae and Everglades runoff. that is highly lethal to the juvenile lobster. It is suspected that the adult lobsters do not have the virus and studies are underway by various groups at this time to research the immunity in some populations of lobster sectors. Increased funding for research will be focused on and there is not any concern that migration of the virus to any other species - including homo sapiens - we will focus on research developments and present those findings here as the menagerie of the scientific community reveiws results. Eating raw oysters - be aware that there are risks involved. Vibrio vulnificus is a bacterium naturally occurring in marine waters and is commonly found in Gulf of Mexico oysters. While not a threat to most healthy people, Vibrio vulnificus can cause sudden chills, fever, nausea, vomiting and blood poisoning. In people with certain medical conditions, death can occur within two days. If you have any of the following, you should not even think about eating an oyster raw: liver disease; hemochromatosis, an iron disorder; diabetes; stomach problems; cancer; immune disorders, including HIV; long-term steroid use, as for asthma and arthritis. Fully cooking oysters kills the bacteria. This disease is not a result of polluted waters, so eating oysters from clean waters does not provide protection. Eating oysters with hot-sauce or while drinking alcohol does not kill the bacteria. "See you in Key West!" WEIRD-SHOTSä Not Just a Seasonal Thang! *-- Smuggling boat on a night run from Cuba: capsized in rough seas off Key West early in morning, dumping more than two dozen people into the water and killing one, authorities said. AA passing freighter and a Coast Guard cutter rescued 21 people, but as many as seven people, including two children, may be missing and dead, said Coast Guard spokesman Luis Diaz - a man's body was recovered. Cutters and a helicopter searched the waters for the missing. The group, which included four children, was spotted 17 miles southeast of Key West by crew members of the freighter Claudia C, who heard screams for help. The ship called the Coast Guard and began its own rescue. The State of Florida joined with the National Parks in an area of 151 square miles for a no-take reserve. The reserves will ban all fishing and other take activities in 60 square miles around the Riley's Hump spawning ground and 91 miles square miles near Ft. Jefferson National Park. Florida had 80% of the waters Cutters and a helicopter searched the waters for the missing. The group, which included four children, was spotted 17 miles southeast of Key West by crew members of the freighter Claudia C, who heard screams for help. The ship called the Coast Guard and began its own rescue. *-- The waters immediately surrounding most of the 1,700 islands that make up the Florida Keys have been designated as a national marine sanctuary since 1990. The sanctuary extends 220 miles in a northeast to southwest arc between the southern tip of Key Biscayne, south of Miami, to beyond, but not including, the Dry Tortugas Islands. Authorized by Congress, this sanctuary was established to stem mounting threats to the health and ecological future of the coral reef ecosystem. Major issues facing the sanctuary include declines in healthy corals brought on by an increase in coral disease and coral bleaching, invasion of algae in seagrass beds and coral reefs, overfishing, reduced freshwater inflow from Florida Bay, and damage to coral from careless boaters, snorkelers, divers and occasional large ship groundings. SUPPORTS - HELP SAVE OUR SCHOOLS - GET INVOLVED!